The movie seems to lean lazily, slyly, from one scene to another, tilting and swiveling gracefully but with deceptive speed. It’s impossible to tell how much time is passing, and when; difficult to discern season, inside Iris’ perennially golden-dim house, even with audio cues like cicadas humming – a cinematic sensibility that I tend to think of (probably simple-mindedly) as European. Traditionally climactic moments are muted, absorbed back into the movie’s allover hush; there’s a sense that the movie, or the haunting, is a quiet whirlpool, stirring its contents into one indifferent stream. Time, and therefore knowledge of past and future events, is circularized (although imperfectly perceived: characters’ inability to perceive the nearness of death is illustrated by blindfolds, unnoticed hauntings, and several other disturbing figurations). Long, circularly panning shots literalize this conceit of circular time. Aesthetically, the movie is one of the most beautiful and thorough realizations I’ve seen of the idea that hauntings are palimpsests, that ghosts are trapped by having been written into, imprinted onto the scenes of their deaths, and afterward can move only within that emotional and physical space. (I’ve written before about the notion of hauntings as closed loops in my review of Helen Oyeyemi’s White is for Witching.) This is also an excellent metaphor for psychological trauma, of course. Lily’s crisp, ominous narration, and a single (relatively) long speech from Iris, directly articulate many of the movie’s themes, including the above, but during the movie I was so fixated on watching that I could hardly listen to the dialogue. Perkins plays a game of making much out of little. He pours out long scenes of suspensefully suggestively meaningful almost-nothingness – shots of the house’s spare architecture and smoky wallpaper; Lily hesitantly investigating old artifacts; intensely black nighttime doorways (oh god – already a thing for me); and perhaps the film’s signature shot type: figures with obscured features against, again, jewel-black backgrounds. Most viewers will probably find this frustrating and boring (as confirmed by dismal IMDb and Netflix ratings). Despite being visually entranced, even I started to feel the effects of too much built-up nothing about two-thirds of the way through. I would call my first watch of the movie beautiful, and delightfully scary, but not satisfying. I exited the experience feeling aesthetically courted, but narratively mystified. It’s only through the process of unpuzzling it all through writing that I’ve been able to reach a more intellectual or emotional satisfaction. This is all to the point, of course: a circular narrative denies closure or catharsis, and therefore traditional narrative satisfaction. A tangential difficulty in experiencing the movie as “satisfying” is the fact that Lily, as protagonist, elicits pity but not (at least in my experience) deep sympathy. Her identity is almost entirely defined by her victimhood. (Young Iris only appears for a few minutes, but immediately appeals as a more active and striking figure: the dapper, slightly severe-looking young horror novelist, cigarette in hand.) This gets to one of my open questions at the end of the film: is it intended to work as a meta-commentary on the victimization of women in horror narratives? Its self-conscious title certainly suggests that. Both Lily and Polly introduce themselves by declaring, “The pretty thing that you are looking at is me.” Iris declares witheringly to Lily/Polly that “You pretty things all rot.” i.e., as movie viewers, we expect to see a pretty thing onscreen; as horror movie viewers, we expect to watch her suffer or die. In the context of I Am the Pretty Thing, though, women’s suffering is an almost communal experience rather than a pure spectacle for the external viewer. Lily, Polly, and Iris remain mostly, and sadly, separate; they touch one another’s lives only glancingly; but still they bear witness. Iris writes Polly’s story as one of her novels in order to commemorate and understand her; at the end, we see that she still longs for Polly’s companionship, for the contact offered through the sharing of Polly’s story. The only two male characters in the movie are either outright or subtle aggressors. The second-to-last scene is a suggestive one in which Iris’ chilly estate manager, Mr. Waxcap (! ), examines a house key labeled “MASTER,” before firmly locking up Iris’ house and its ghosts. A blunt reading: men control and isolate women’s narratives. I Am the Pretty Thing has at least two crucial antecedents: Charlotte Perkins Gilman’s “The Yellow Wallpaper,” and the works of Shirley Jackson. “The Yellow Wallpaper” is present in a strikingly visual way, as scene after scene features a particular shade of slightly drab golden-yellow – Lily’s cardigan and the curtains are nearly the same shade, for example. Meanwhile, Shirley Jackson might as well be the movie: when you say “midcentury female American horror writer,” there is only Shirley Jackson. Adding in “reclusive” and “New-England-based” is just icing. And finally, I’d say there’s a good dash of Poe in there too – specifically “The Black Cat.” All three of these, but especially Gilman and Jackson, portray domestic experience, houses, and walls as traps for women, constructed by men. 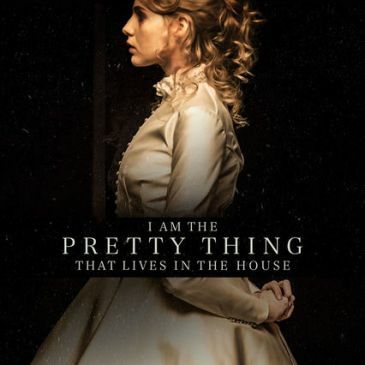 I Am the Pretty Thing offers a much less polemical or overt experience of those same themes. They’re menacingly present, but rather than raising them to the conscious level of a critique, Perkins plays them off more light-handedly, letting them drift and mingle with the other narrative threads, adding to the general smoke of unease and sorrow. Wow novel length long but will read once I’ve seen this trifecta of cinema!! I couldn’t get Rachel to see the witch… Maybe if i get us good mojo crystals to wear.. *one of my customers has been giving me one piece of selenite for every piece of jewelry i buy.